Tourism operators in Samoa are urging holidaymakers already booked to visit the islands to go ahead with their plans as a means of helping the tourism-dependent destination get back on its feet after the recent tsunami. 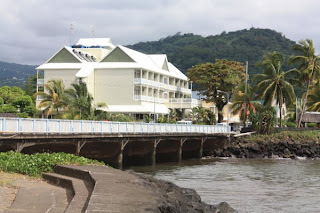 "There are many parts of the islands unaffected by the tragedy, and by continuing with their plans to holiday in resorts in those areas, visitors will be putting much-needed dollars into the economy to help the whole nation rebuild," said long-time hotelier Fred Grey, whose Aggie Grey's Hotel and Bungalows in Apia and its Lagoon, Beach Resort & Spa on the north coast were unaffected. "Many people don't realise that the capital Apia and all resorts along the north coast were totally unaffected by the tsunami and that all services and infrastructure are running normally," he said. Mr Grey said the Samoan people had shown enormous resilience and with their deeply religious culture were all working together to rebuild those areas most badly affected. "They have a wonderful spirit of community, and everyone unaffected is helping those whose lives have been torn apart… including staff who have jobs in resorts that are still operating, sharing their earnings with the less fortunate. "That is why we are really urging holidaymakers to go ahead with their plans to visit Samoa: their 'tourism dollars' will contribute dramatically to helping the rebuilding of homes, schools, hospitals and resorts, and assist at the same time in the grieving process of these wonderful people." Holiday-goers who feel that by visiting Samoa they can assist the local recovery process, should contact travel agents about properties that are open and operating normally, or phone (02) 4448 8885.